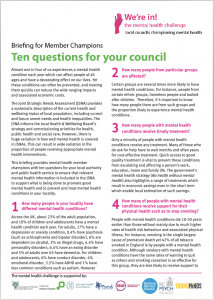 The Mental Health Challenge for Local Authorities began in 2013 in order to encourage and support councils in England to champion mental health in their communities. 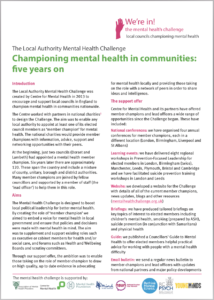 In the five years since we have brought together 120 local councils with elected member champions for mental health. This short report summarises what we have learned in that time and our plans for the future. 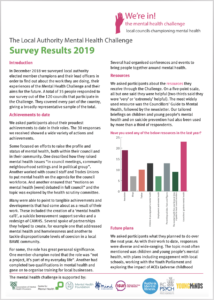 In December 2018 we surveyed local authority elected member champions and their lead officers in order to find out about the work they are doing, their experiences of the Mental Health Challenge and their aims for the future. A total of 35 people responded to our survey out of the 120 councils that participate in the Challenge. They covered every part of the country, giving a broadly representative sample of the total. Whilst smoking rates in the general population in England have declined, the rate of smoking amongst individuals with a mental health condition has remained consistently high at approximately 40%. 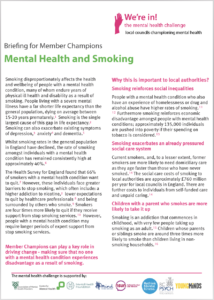 This briefing written by Action on Smoking and Health on behalf of the Mental Health Challenge aims to help Mental Health Champions and their colleagues. 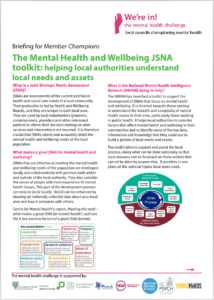 We have created the joint strategic needs assessment toolkit to help local authorities understand and consider the factors that affect mental health and wellbeing in their communities and to identify some of the key data, information and knowledge that they could use to build a picture of local needs and assets. More than 1 in 10 women develop a mental illness during pregnancy or within the first year after having a baby. 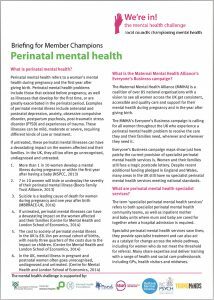 If untreated, these perinatal mental illnesses can have a devastating impact on the women affected and their families. We have summarised the evidence and how local authorities can do to lead the way in this briefing. About one in ten children experience a mental health difficulty at any one time. And many more are at risk of later mental health problems resulting from their early experiences in life. 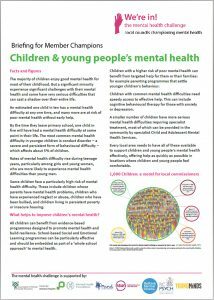 This briefing summarises the evidence about children’s mental health and how local authorities can lead the way in changing children’s prospects. About a third of people with a long-term physical condition also has a mental health difficulty. And about half of people with mental health problems also have poor physical health. 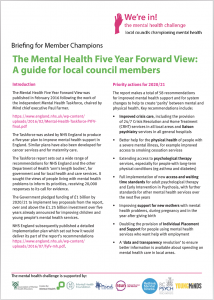 This briefing looks at what can be done to bridge the gap between mental and physical health services to give everyone the support they require for both. 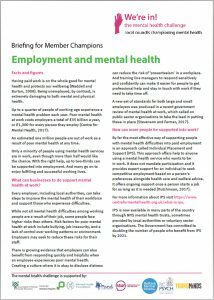 Being in work can be good for mental and physical health, but too many people with mental health problems do not get the right help into employment. And some workplaces can undermine people’s mental health. 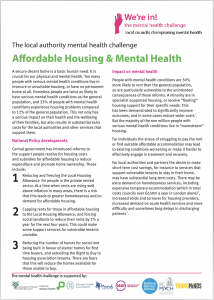 This briefing explores what local councils can do to help. Local Authorities have a key role to play in preventing suicides in their communities by working with local partners. 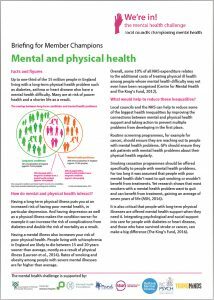 To help Member Champions we have created a suicide prevention briefing with key facts and figures. Too many people with serious mental health conditions live in insecure or unsuitable housing, or have no permanent home at all. 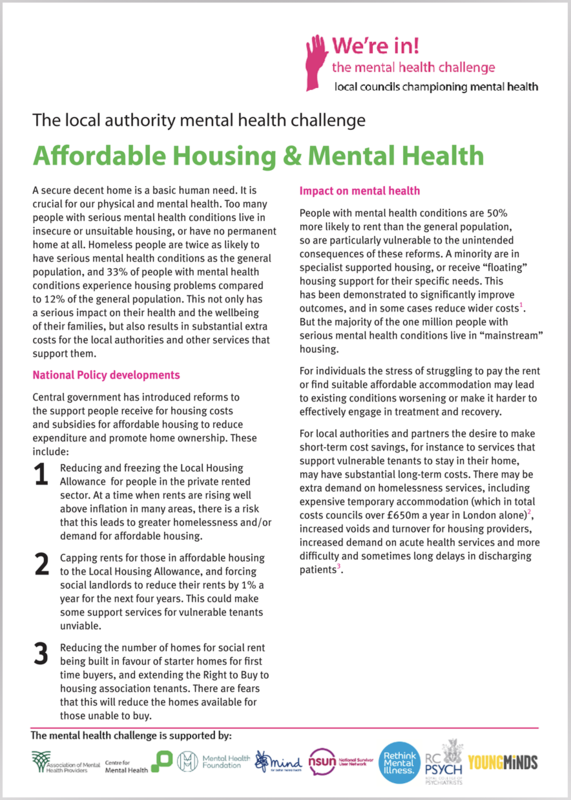 As Councillors have a key role in implementing the mental health strategy and improving mental health in their communities, we have created a briefing on housing with five questions to ask their authorities and partners. 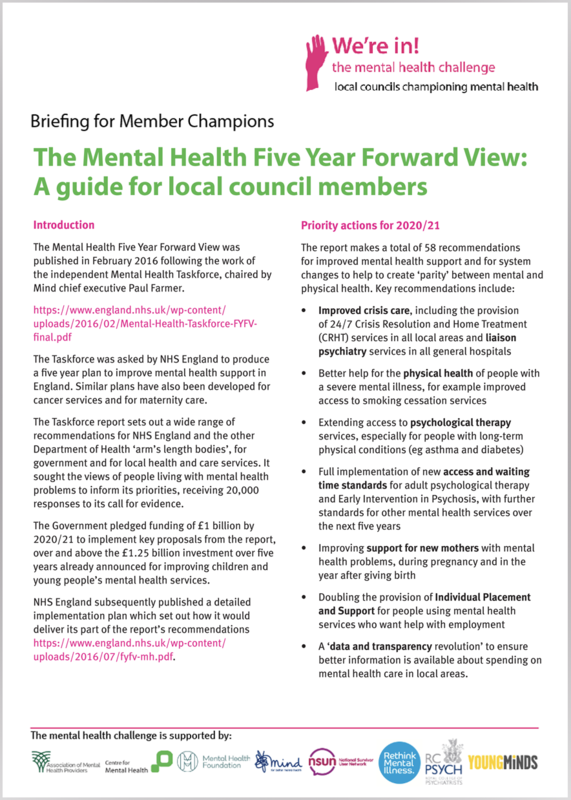 Following the launch of The Mental Health Five Year Forward View, we have created a summary guide breaking down the key priorities for our Councillors. 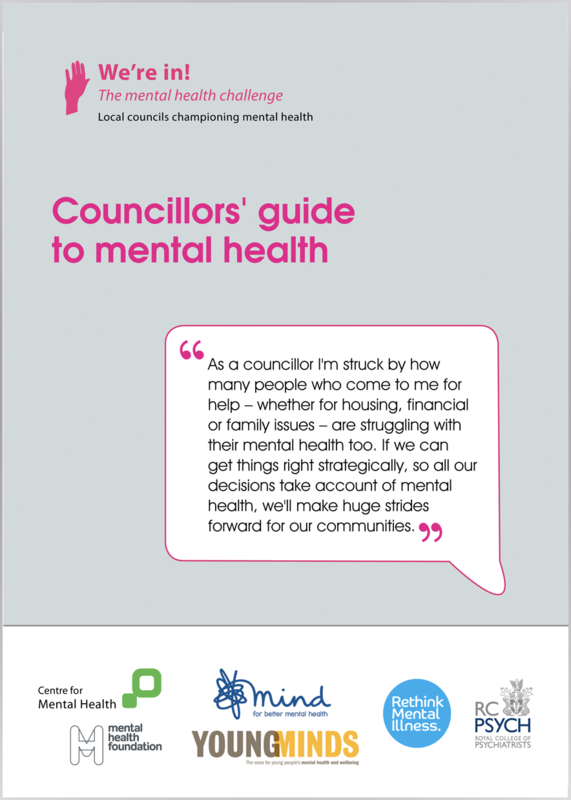 This booklet provides practical tips and advice on how to support constituents and where to signpost them. 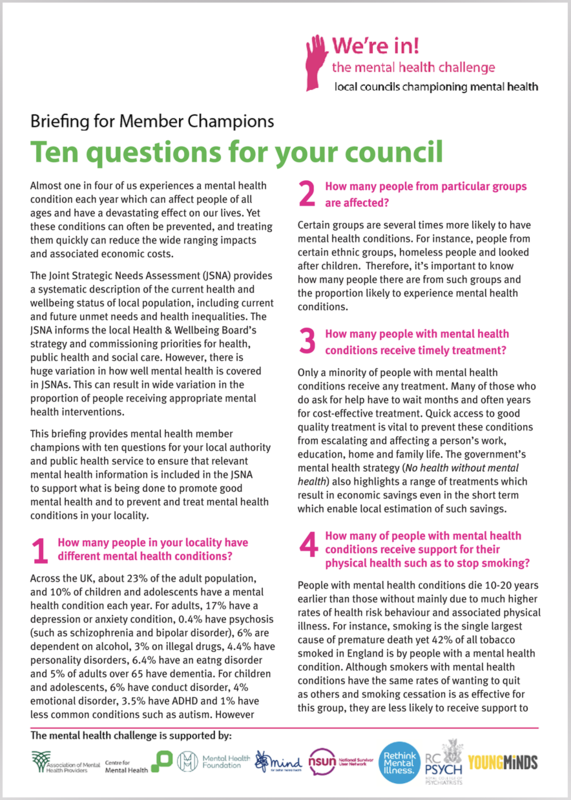 This briefing provides councillors and health champions with ten questions to ask their public health teams. 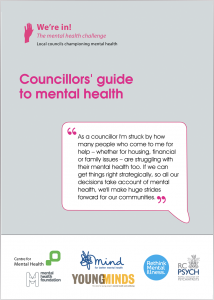 It aims to help local authorities promote the wellbeing of their population and improve the recovery of people with mental health problems by providing information about the size, impact and cost of the unmet need to treat mental health problems, to prevent them from arising and to promote wellbeing. "As the Mental Health Champion for Oldham Council I will be promoting mental health issues within Oldham. 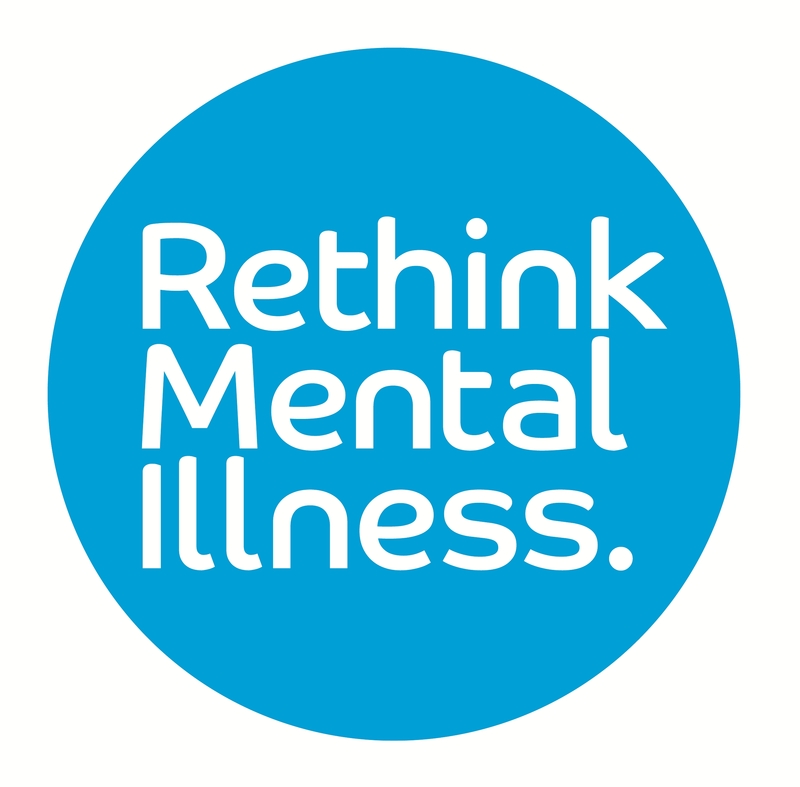 My role will help to influence the way Oldham Council tackles mental health issues and dispelling the myths and misconceptions around mental health. I will be working closely with key services to help ensure that work to improve mental health is given the priority it deserves."